How can I create irregularly spaced box plots in Grapher? 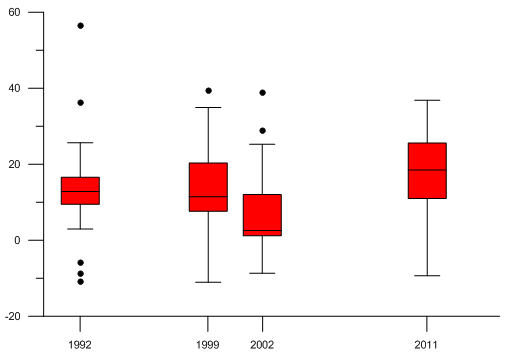 Click the Home | New Graph | Statistical | Vertical Box Plot ( ) command. Click on the box plot to select it. Change the Last variable to be the same as the First variable. Only one box is now plotted. In Grapher 13, change the Last column to be the same as the First column. Click on the Box Plot Axis to select it. Change the Length to twice the desired width of the bar. So, if the box should be 0.5 inches wide, make the Length equal to 1.0 inches. In the Select Plot Type dialog, select Vertical Box Plot and click OK. The Choose Axes dialog will appear automatically set to create new X axis. Click OK. Select the data file and click Open. Repeat steps 2 through 4 above for the new box plot. Click on the new box plot axis and move it left/right to the desired location. Repeat steps 8-13 for each additional box plot. If the labels are incorrect on the box plot axes, you can uncheck the boxes in the Object Manager next to each Box Plot Axis name. Then, add a new axis by clicking the Graph Tools | Add to Graph | Axis command. Label the new axis as desired. If you want the boxes to move with other plot changes, you can link the Box Plot Axis location to the new axis. Create variable spaced box plots using multiple box-plot axes. If you would like to have boxes placed with variable spacing, email Grapher support to add your vote for this feature to our suggestion file. How can Grapher create a notched box plot?